"THREE SISTERS standing together ©2012 Brenda Mangalore/Sashé Studio"
As mentioned yesterday, here are the results of my experiment. I repeated same-ish marks across three canvases to see what would happen in producing a kind of Limited Original Reproduction. In a way, they are kinda like siblings. Or triplets. They all have the same DNA, the same elements in their make-up. But they have their own personalities. As their stories developed, so did their uniqueness. "THREE SISTERS #1 Acrylic on canvas, ©2012 Brenda Mangalore/Sashé Studio"
Initially I thought it would get a bit repetitive. Maybe the repeats would detract from the beauty of each original. But now, seeing all three together I really like seeing the same-ness & the differences at the same time. I think they sit well together but they also hold their own individually. They aren't like diptychs, where both canvases need each other to be whole. These three were created together BUT each were also created to be an individual. "THREE SISTERS #2 Acrylic on canvas, ©2012 Brenda Mangalore/Sashé Studio"
Time will tell if this experiment is onto a winner. I think I will need to continue testing. 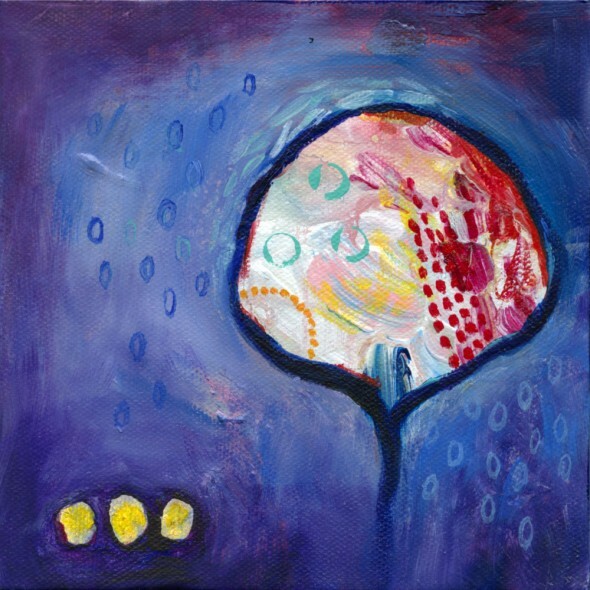 "THREE SISTERS #3 Acrylic on canvas, ©2012 Brenda Mangalore/Sashé Studio"
Does it work as three pieces or one? What are your initial thoughts on Limited Original Reproductions? Which one is your favourite? Or do you prefer all three to stand together?